There are three Guild buildings on the property. Come in the rear entrance of the single-story white “house” with a vegetable garden in front. Start off the week of Valentine’s Day with Registered Dietitian Timaree Hagenburger, “The Nutrition Professor,” and “Love the Food that Loves You Back”! Join SVS and Timaree, brainchild behind the “Foodie Bar” concept, for round two—we had so much fun at the July potluck, we’re doing it again! If you caught Timaree’s SacTown VegFest talks this year and last, you know how accessible and entertaining her informative presentations can be. If you didn’t, now’s your chance! What’s a Foodie Bar? Foodie Bar Potlucks are the BEST! • Everyone chooses one or more tasty items from our online sign-up list* of plant-based foods to bring to this fun, interactive event. If you have a copy of “The Foodie Bar Way,” you can choose one of the listed recipes from the book. • Each of us will get busy loading a potato just the way we like it! • Enjoy a feast with lip-smacking options for everyone! Dessert-related cooking demonstration: Timaree will wow us with a quick, easy, healthful, delicious sweet treat. 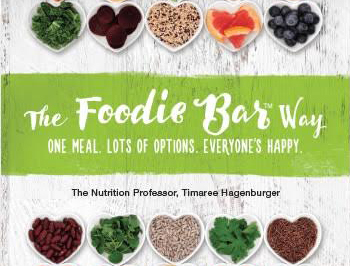 Book Signing: Timaree will be honored to sign copies of her book “The Foodie Bar Way” (a great addition to your kitchen, and a perfect gift idea for Valentine’s Day)! It is such a fun way to support those who mean the most to you by helping them Love The Food That Loves Them Back, too! • Just one (vegan/plant-based) ingredient for the Foodie Bar! • A list of your ingredient(s). Any questions? Drop us a line right here or at sacveggie@gmail.com. Parking: Free, off-street, and lots of it. Just one block from the T Street bike path. Everyone is welcome. Bring your friends, family, neighbors, co-workers, etc.! 3. Sign up! It’s Easy—you will NOT need to register an account or keep a password on SignUp.com. Note: SignUp.com does not share your e-mail address with anyone. If you prefer not to use your e-mail address, please contact us so we can sign you up manually.